The Problem of Epilepsy. Management of Epilepsy from Diagnosis to Intractability. Managing Cognitive and Behavioural Consequences of Epilepsy. Theoretical and Methodological Issues in Measuring Quality of Life. A Review of Currently Available Quality of Life Measures. Impact of Epilepsy on Quality of Life in Adults: A Review. 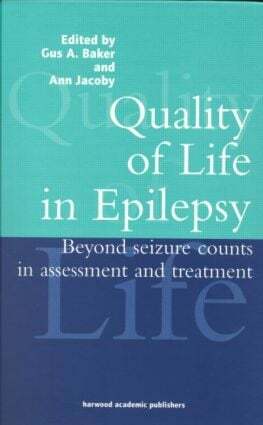 Quality of Life Issues for Children and Adolescents with Epilepsy. Quality of Life Issues for Older People with Epilepsy. Epilepsy and Learning Disability. Implications for Quality of Life. A Physician Reflects on Quality of Life. Can Quality of Life Assessments Contribute to Everyday Clinical Practice? Use of Quality of Life Assessment as an Outcome Measure in Clinical Research. Quality of life as an Outcome Measure: A Pharmaceutical Industry Perspective. Living with Epilepsy: A Personal Account. Living with Epilepsy: A Family Account. The Role of the Primary Care Practitioner. The Contribution of the Clinical Psychologist. The Contribution of the Nurse. The Role of the Social Worker. Support Groups for People with Epilepsy. Improving Quality of Life: The Next Steps.